Green Glue Company soundproofing through isolation. The Green Glue Company now has a new soundproofing product on their website. 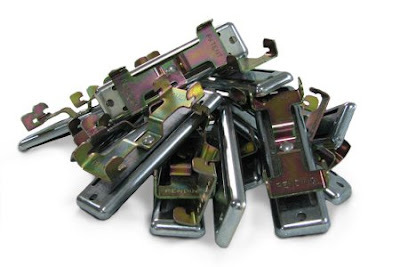 They are calling them "Noiseproofing Clips", other common names for this type product are soundclips and sound isolation clips. These clips will mechanically separate two sides of a wall and can improve sound transmission by allowing one side to vibrate independently from the other. They claim when used in combination with Green Glue , more than 95 percent more noise can be stopped than through conventional construction. One clip which covers 5 square feet costs $5.25.